True to the proprietor’s word the Mini Mart Deli Grocery at 1068 Manhattan Avenue is open for business! The (admittedly limited) produce section sports some of the freshest veggies I have ever seen north of Green Street. A vast assortment of Indian sweets graces the space next to the cash register. When I went to purchase my $1.00 extra large cup of tea (per the owner this was a “special grand opening offer”) a woman was busy selecting her confection of choice. It was a time-consuming decision (hey, I understand) but she was pleased with her choice. And the proprietor, who is a very nice guy, promised her a free cup of coffee in return for her patronage. This same gentleman assured me he will be stocking a vast array of “heat and eat” Indian foodstuffs (starting at buck a pop) for north Greenpointer’s (24 hour) delectation. I can hardly wait! 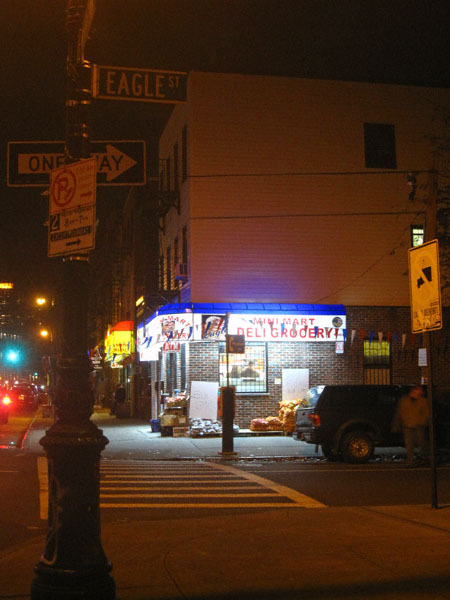 7 Comments on Greenpoint Bodega Watch: OPEN! That address was the location of M&D (Minarczik and Dragula) Grocery. It was a amily owned business which was a neighborhood fixture for over fifty years, finally closing upon the death of Chester Dragula, in 1978. It was the kind of place that let you buy your groceries and put it “in the book” until payday. Nobody was turned away for lack of money. The same with Charlie’s Vegetables and Fruits and Zach Bros. Meat Market at 1022 Manhattan Avenue. Thank you so much for sharing this building’s history, SGI! Although I like to do research (online) the fact of the matter is it is personal accounts that make this neighborhood (and writing about it) so interesting. Lest you are not aware, the original building (M&D) was demolished. This came to pass in 2005. A new building shortly thereafter took its place. It took a long time before anyone bothered to open a business on the first floor (I imagine the landlord was greedy and was expecting a draconian amount of rent). Now someone has moved in and he struck me as being someone with a good heart. This would be in keeping with what you have told me about the previous owner(s). Thanks for reminding me about the rebuild, missheather. At least the structure isn’t architecturally out of place with the rest of the block. I grew up on Dupont Street, between Manhattan and Franklin; and, it’s a shame that almost every house on the even numbered side of the street, the ones that a large number of people (me included) called home were demolished in the name of eminent domain. Ah, but that’s a story for another time. Keep up the great work chronicling Greenpoint. Indian sweets! Oh I am so excited by this, more than you can imagine. Gulab jamuns, you will be mine. Even if my teeth ache from your sweetness. I also like very much the idea of the possibility of Indian food available here in Greenpoint. aw! Paws down! How nice to read the history of that building and how you met Bodhi! 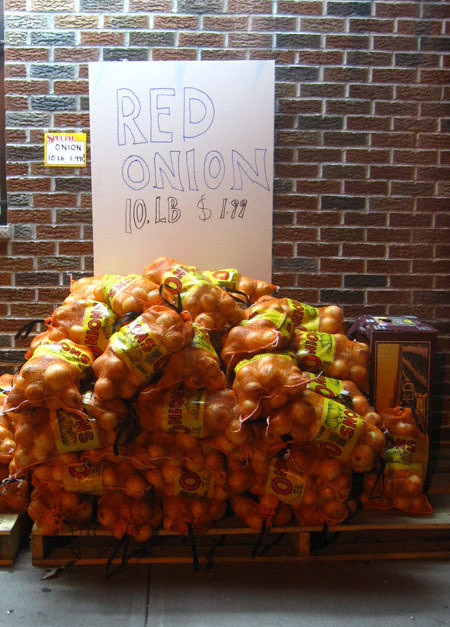 They may have great prices on onions but they make me cry with their racism.